It’s really important that you bring the right kit on weekend trips for your own safety on the mountain. A lot of kit can be borrowed from UBES: simply drop our Kit and Safety officers an email (ubes-kit@bristol.ac.uk). Additionally, if you’re missing an item of personal kit, drop a question on the Facebook forum and one of our lovely members might just be able to help you out! UBESters enjoying some well deserved post-walk relaxation! We will usually email out this kit list with any trip-specific comments, but hopefully this will serve as a general guide. Sleeping mat (*) – some of our accommodation has bunk-beds available, but always bring your own mat just in case! Any UBESwear you have- so you can flaunt it! We provide ice axes and crampons free of charge to members on walks that require them – if you happen to have your own, please bring on relevant trips! Games/items of fun for the evening. This article from the British Mountaineering Council gives some good advice about keeping warm and dry on the mountain. Don’t worry, you don’t need to fork out loads for kit! In general; avoid anything cotton or jeans- they’re too slow to dry, and bring plenty of layers to stay warm. A quick fix for a waterproofs and boots that might have passed it prime is using NicWax Tech Wash and Reproofer. 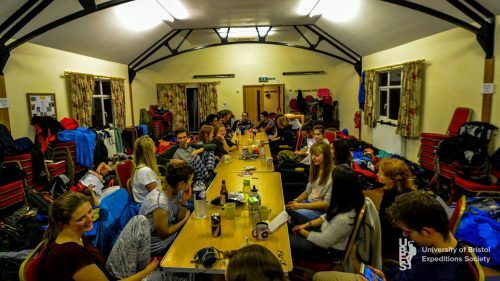 If you’re looking to buy some more kit, why not come along to our kit night held at Cotswold Outdoor where UBES members can get huge discounts on all kinds of kit. It is held in the autumn term and the date will be released on the calendar. Any queries on what to bring drop us an email. UBES is happy to lend out our kit to paid members throughout the year and even over the summer. The kit available varies from tents and sleeping mats to stoves. We can even lend out ice axes and crampons for people seeking to do winter walks. There are also maps and guidebooks covering most of the UK’s national parks and even places further afield for planning your own trip. Climbing kit including harnesses, shoes, ropes and a fully equiped trad rack are all available for people who have shown that they know how to use the equipment safely and properly. The only exception to this is that harnesses will be taken down to Redpoint climbing wall on Wednesday afternoon climbing sessions by the committee for people to borrow for the afternoon. There is no charge to use our equipment, just please return it in the same condition as soon as you can. All you need to do to borrow some kit is email our kit and safety officers.